Given some of the extreme blood readings 2Pac has had over the past couple of weeks, the vet suspected the Somogyi Effect. 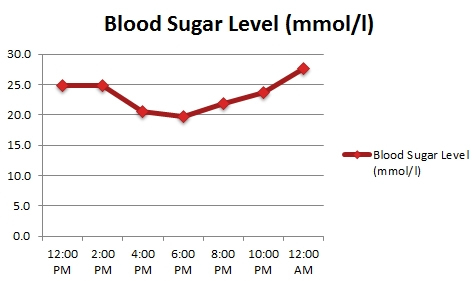 So, we went to the vet again on Saturday and started a blood sugar curve that I completed throughout the evening at home. You can see that the curve is gentle, so is definitely not indicative of Somogyi Effect. This is a relief, but his numbers are still showing very high readings. His ataxia disappeared on Sunday, but returned by Monday night. It’s now Tuesday night and he’s doing really poorly.